Roasted Portobello mushrooms, artichokes, zucchini, Spanish onions, red peppers, and Kalamata olives are hand rolled in a sheet of pasta with a mixture of ricotta and parmesan cheese. To finish off this colorful pinwheel, our chefs then hand wrap a thin Layer of Artisan mozzarella cheese. Kabobs prides itself in utilizing only the freshest, premium ingredients available in creating our extensive line of gourmet, handcrafted appetizers and entrees. Gourmet food at its best! Innovative cuisine for five star chefs, foodservice, restaurants and professional caterers. Bake in a pre-heated 350 ºF convection oven for 6 - 8 minutes or until Internal temperature reaches 165 ºF as measured by use of a thermometer. Kabobs’ Roasted Vegetable Lasagna not only screams comfort food, but addresses the rise in vegetarian diets with consumers. 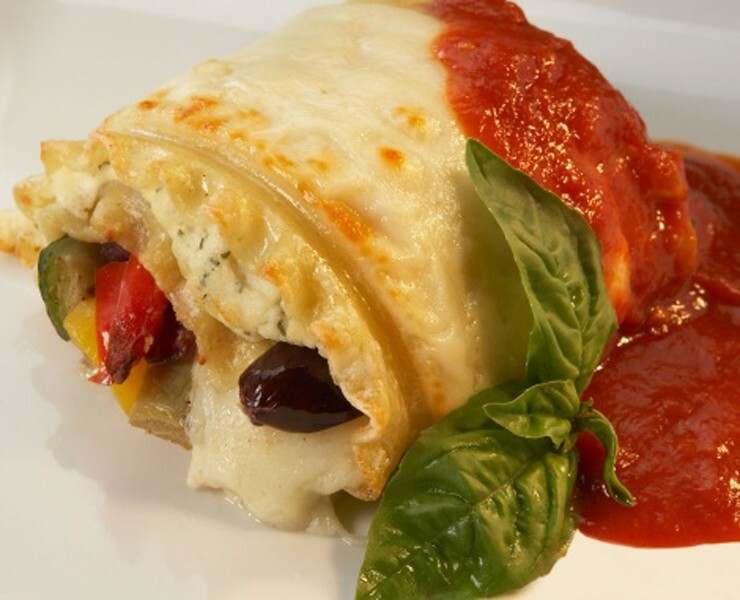 A colorful pinwheel of fresh and vibrant vegetables, the Roasted Vegetable Lasagna are individual portioned for rapid deployment and can be customized by a chef with their favorite sauce – zesty marinara or a rich cream sauce. A welcome addition to Kabobs rising Entrée offering, the Roasted Vegetable Lasagna is a direct answer for chefs needing prepared entrees, as a result of a lean kitchen staff. Colorful item. Customizable with sauce. Our signature, handcrafted buttermilk biscuit, filled with gently folded eggs, Monterey Jack cheese, and applewood smoked bacon, folded in a crescent.